Of the various methods of hypnosis, eye fixation is perhaps the most heard of, talked about and practiced. And that is perhaps because this is one method that is easy to implement. The eye fixation method was developed by James Braid – a person whom the present hypnotherapists regard as the founder of Hypnotherapy. Since James Braid was an eye-specialist, it was but natural that his initial method of inducing hypnosis would have something to do with the eyes. The eye-fixation method of hypnosis involves producing immense strain on the eye muscles. This is produced as you look upward with your eyes, without any movement of your head and gaze fixedly at any object or a point on the wall or ceiling. There are reasons for gazing upwards in this way. The upward gaze will quicken and intensify the tiredness that you will feel in and around your eyes. Don’t tilt your head backward during this time as that will assist the eyes and lessen the strain on them. Move the eyes but only with the head sitting balanced upon your neck. With the eyes being fixed in this way, there will be some minor strain on your eyes and a somewhat sleepy sensation will slowly engulf you. Through this process, you will also come to develop intense concentration as you stare at one point. Select a place and sit comfortably. You must settle down before the next step. Select a place on the wall that you want to focus on. Choose a spot that is about 70 degrees up from the horizontal. The spot can be the corner of a picture frame, a shadow or simply anything that serves as a point of interest. As you focus on the spot, make sure that only your eyes are angled upward and not your neck. With the spot being decided, start focusing on it with intense concentration. Do not divert your eyes. You will slowly become aware of the muscles around your eyes, the tension in the muscles holding your eyes open and even your eyelids. You might start blinking more frequently and your breathing might deepen. You will become aware of the eyelids becoming heavier. Continue focusing and keep your eyes open. Some people report blurred vision at this point while others report a misty effect. Experiences differ from person to person. Your arms, legs and eyelids will seem to get heavier. Imagine the sensation that you will feel on closing your eyes. Slowly close your eyelids and experience the relaxation you have imagined. Breathe deeply and become aware of the relaxing effect coursing through your body. After you have let the relaxing effect seep in, help yourself come out of the hypnotic state by taking a couple of deep breaths. Follow this up by moving your fingers and toes and slowly opening your eyes. Think about the challenges in real life and draw strength from this experience to cope with them. 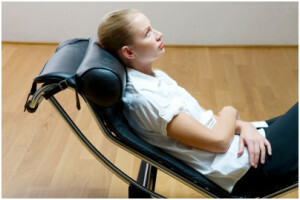 Self hypnosis through the eye-fixation method has a rejuvenating and relaxing effect. If you want to try it, watch this video for a better understanding of this process. However, the video will show one modification. Instead of gazing at a spot on the wall or ceiling, it will teach you to focus your gaze on the palm of your own hand. Previous Post How To Use Eye-Fixation For Self-Hypnosis Next Post How To Improve Your Self Esteem With Self Hypnosis!